Learning how to cook leeks makes it simple to add them to your healthful dietary plan. Leeks are part of the onion family. They may sound a bit exotic, but there are many well-known dishes that incorporate leeks: vichyssoise is one of them. This dish combines potatoes and leeks into a pureed cold soup. The more advanced cook may use leeks as part of a bouquet garni. This is a fresh herb mixture used to flavor vegetables and meat while cooking. It is typically wrapped in cheesecloth so it may be removed before the food is served, but leek leaves may be blanched and used as a flavorful wrapper, instead. Leeks are not only healthy secondary ingredients, in many recipes leeks are the star of the show. In these recipes, such as leek soup, the leek is usually cooked on stove top or in the oven with the other ingredients used in the recipe. According to Nutrition Data, one leek contains 54 calories and zero fat. It also has 18 mg sodium, 13 g carbohydrates, two grams dietary fiber and one gram protein. High in vitamins A and C (30% and 18%, respectively), one leek also contains five percent of the recommended daily allowance(RDA) for calcium and 10% for iron. Leeks are high in sulfur, which is thought to be beneficial to boosting the immune system and helping the body detoxify. Sold in bunches, the best leeks are those with a slender white bulb and several inches of white stalk prior to turning green in color towards the top. The leaves should be dark green and rolled tightly together. If the bulb is round like a bulb rather than a slim part of the stalk, the leek is older in age and won’t provide the desired results a younger leek will. The leek’s flavor will affect other foods it is stored with, so its best to store it in a vegetable drawer in the refrigerator, lightly wrapped in plastic wrap. Do not wash or trim leeks until you are ready to use them. 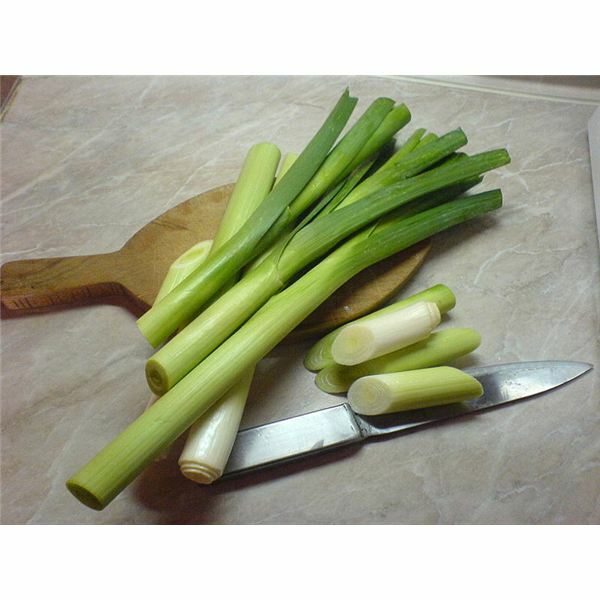 When ready for use, wash the leeks and then trim off the bulb, about ¼ inch into the white stalk. From the leaf end, trim off the leaves all the way into the green stalk, leaving several inches of green stalk. The leaves can be used for bouquet garni or all the trimmings can be put into a compost pile. Please note that leeks are a bit on the delicate side. Overcooked leeks get slimy. Leeks can be substituted for onions in many cases, but the reverse won’t always work well. This is because leeks have a more delicate flavor than the typical onion. Leeks can be used in recipes in their raw form. Thin slices can be used much the same way thin slices of raw onion would be used. They can be added as a topping or into salads. Leeks, like onions, may be caramelized and added as a topping or ingredient in many recipes. This includes substituting caramelized leeks for caramelized onions. Grilling brings out flavors in the leek simple baking with other ingredients won’t. The leek can be part of a kabob or a platter of grilled foods. It can be a topping for burgers (veggie or meat) or tossed into a side dish to add a unique taste twist. Leeks are a nutritional and flavorful addition to cooking and any dietary regime. Learning how to cook leeks in a variety of ways adds to the options the home cook will have in making them a regular part of a healthy meal plan.